A celebration of jazz not to be missed! For one night only at the Brooklyn Theatre! 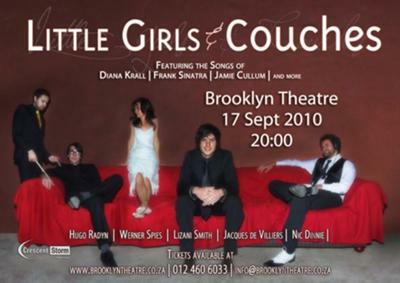 Little Girls & Couches is a Crescent Storm Production, featuring the beautiful vocals of Lizani Smith, accompanied by a stellar jazz band. They will be performing songs from the likes of Jamie Cullum, Frank Sinatra, Diana Krall and as well as the odd song or two you wouldn't expect to hear at a jazz show. Intertwined with stories, this promises to be a memorable night! Make sure to book your tickets at http://www.brooklynteater.co.za. Tickets are R80 and R100.